On a recent day trip to the beautiful (and beautifully underpopulated) village of Cherry Valley, I spotted this poster for Mighty Flame, a brand of propane tanks. We’ve got two figures gleefully running over the Windows XP field to get to a giant propane tank. It’s totally the XP field. So in this weird Alice-in-Wonderland-style alternate universe, people don’t wait in line at a gray cement gas station to fill a propane tank. Instead, they run through a technicolor meadow. And they’re so darned happy that they don’t just run, they skip. This includes not only the pigtailed girl but ALSO the awkward 30-year-old dude in a black tee shirt. Can you imagine the photo shoot for this? I sure like to. As a vegetarian who sunburns in 15 minutes, I’m probably the wrong demographic for ads related to backyard grilling. Propane tanks also terrify me because one time a loose arsonist nearly blew up the front yard of our old apartment, tanks included (true story). So, at least for me, “Mighty Flame” is the worst possible brand name. 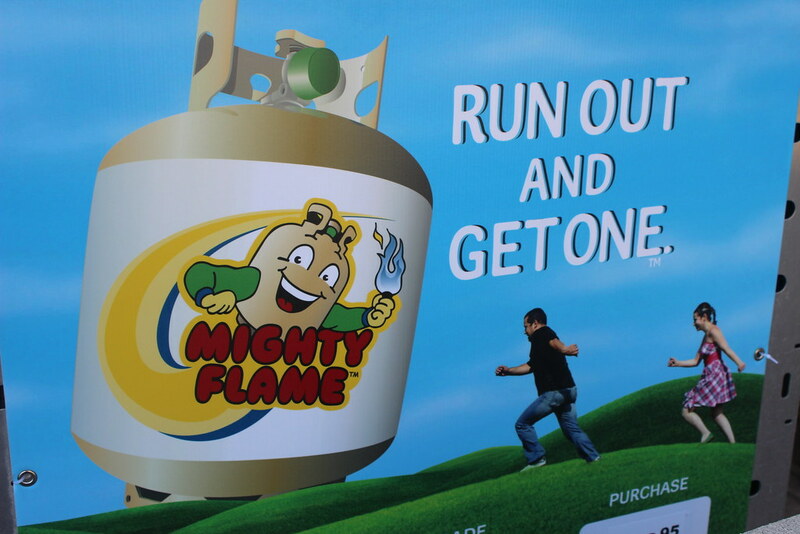 “Mighty” put in front of “flame” evokes exploding propane tanks, house fires, brush fires, kitchen fires, and other nightmare fodder. “Tiny Flame”, “Safe Flame”, “Can’t Blow Up” — all would have been better, less alarming, choices. Marketing loves commanding words like “Get.” “Get out there,” says Ford. “Get Your Own,” says Subway. This always feels a little pushy. “Run out and get one” implores us to do not one but TWO things. Jeez, man. I’ll do what I want, when I feel like it. Quaint and awkward. I’ll take that over slick and brainwashy any day.